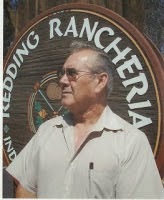 Today is the 11th anniversary of the unjust disenrollment of the Foreman family from the Redding Rancheria in 2004. Bob Foreman was the first elected tribal chairman and frankly, there should be a statue on the reservation honoring him. Instead, his family is no longer in the tribe. Chairman Foreman passed away just over six year ago, before seeing justice done. He was instrumental in establishing three Indian Health Clinics, in Shasta, Trinity and Siskiyou counties when there was NO healthcare for many American Indians. The Foreman family, sold their land to the tribe so that the Win River Casino/Hotel could provide economic help for the tribe, improving their lives with employment, education and elder care. Everything happens for a reason. The Foreman family has a story and the book is being written. Stay in the flow and the good and truth will always be broadcast. I hope sooner than later the truth prevails.